Actually, Robbie Savage, it was *just* the 44 passes as Ilkay Gundogan finished off a superb team move to seal the Manchester derby in City’s favour. Still, not bad. Over the course of a minute and 55 seconds – or 2.13% of the entire game – the hosts produced neat one-touch moves, triangles and dynamic runs, leaving the Red Devils chasing shadows. And what a time to bring it together, with Jose Mourinho’s Manchester United seeking an equaliser in the closing stages after Anthony Martial had halved the deficit to 2-1 at Etihad Stadium. There was no passing it about at the back, or dilly-dallying with goalkeeper Ederson – nearly every pass in the move happened in either the middle or final third, before working it to Bernardo Silva, Raheem Sterling and finally Gundogan, who pulled the trigger. The move left Match of the Day 2 pundit Alan Shearer purring. “It was incredible, absolutely magnificent,” Shearer said. “City were full of confidence, and everyone knows what their plan was there – they knew they were keeping hold of the game, to try and get United to come at them. “United didn’t really want to press them – it was half-hearted and, if you do that against City, they will punish you. In time-honoured tradition, social media went into meltdown. 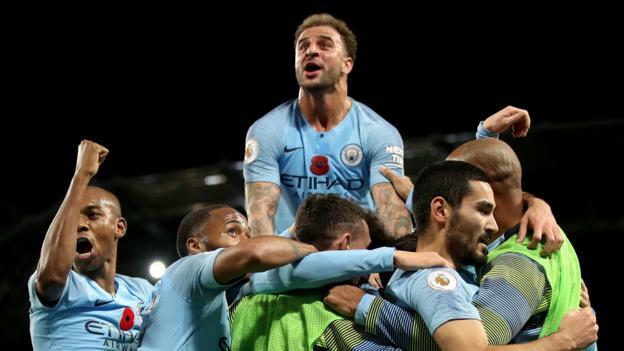 Former Manchester City playmaker Rodney Marsh called it “THE perfect goal”, while BBC Match of the Day host Gary Lineker said City “really are one hell of a side”. But it’s not all bad for the red half of Manchester. City’s move was one short of the 45 produced by United for a Juan Mata goal against Southampton in 2015. City have previous as well, sticking 52 passes together in scoring against West Brom in the Carabao Cup last season. Sonsofpunjab: Man Utd and Man City may be in the city but are worlds apart when it comes to football…. City so so good, Utd so so awful. Andrew Reyes: In truth, City are on another planet compared to United. David: Brilliant play and control by City. No comparison in the two teams. Well done City!